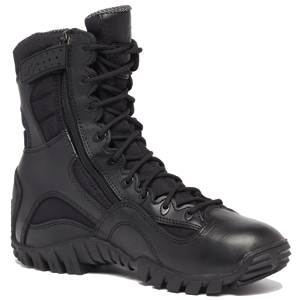 The Tactical Research TR960Z WP Khyber Waterproof Zipper Boot is a lightweight hybrid boot designed for military, tactical users, and law enforcement looking for high performance, comfort, and durability. It features a waterproof, Gore-Tex bootie to keep you performing in cold and wet weather. A convenient side zipper saves time for those on the go. This boot features a contoured footbed for a low-profile fit and feel which increases agility and stealth. The upper is constructed of 100% cowhide smooth leather and abrasion resistant nylon. Aggressive lugs aid in quick direction turns, crawling, and rope rappelling. Air mesh ensures your feet are kept cool all day long. A moisture wicking lining brings eliminates wet and sweaty feet even after extended wear. The TR-1 insole provides an orthotic fit with extra padding to reduce shock on your ankles and knees. The TR960Z WP is built tough to maximize your performance while providing first class comfort that will keep you always ready for your next mission.